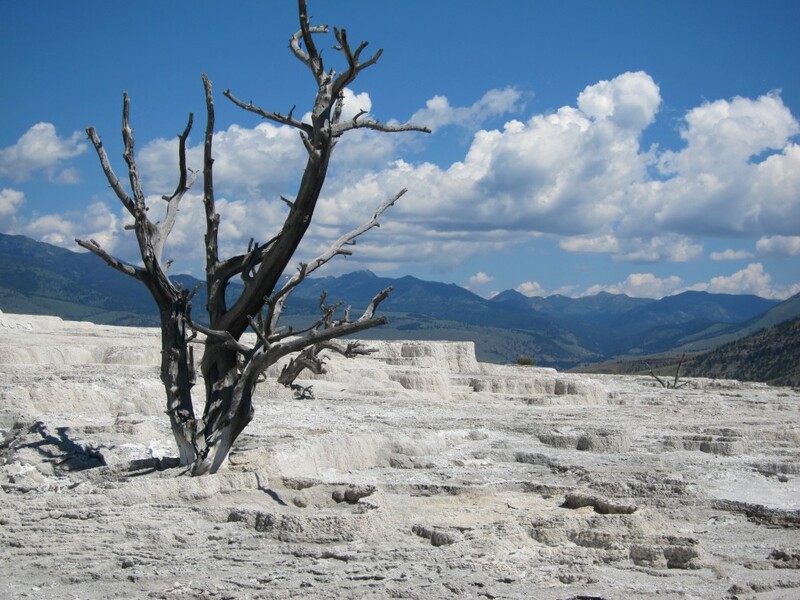 Yellowstone National Park has so many amazing things to see. 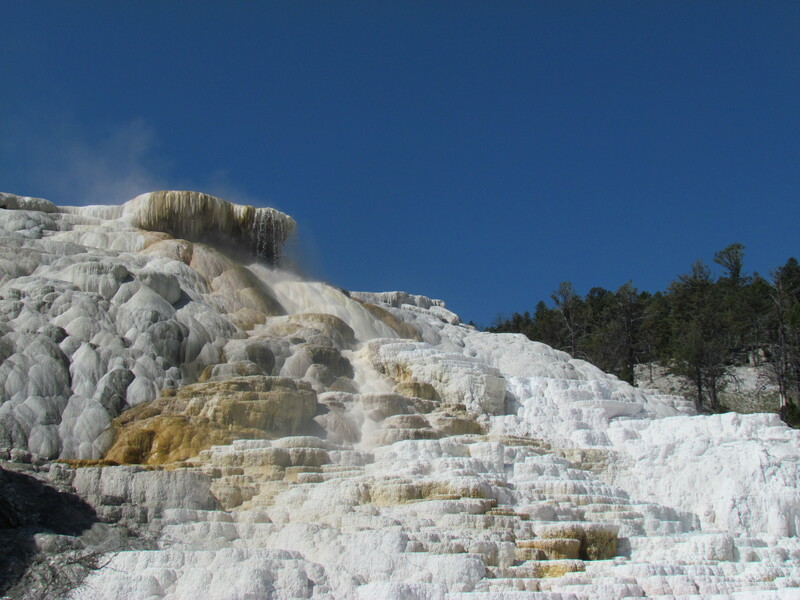 Just like millions of others, I’ve always wanted to go there to see the geysers and to see the Grand Canyon of Yellowstone. 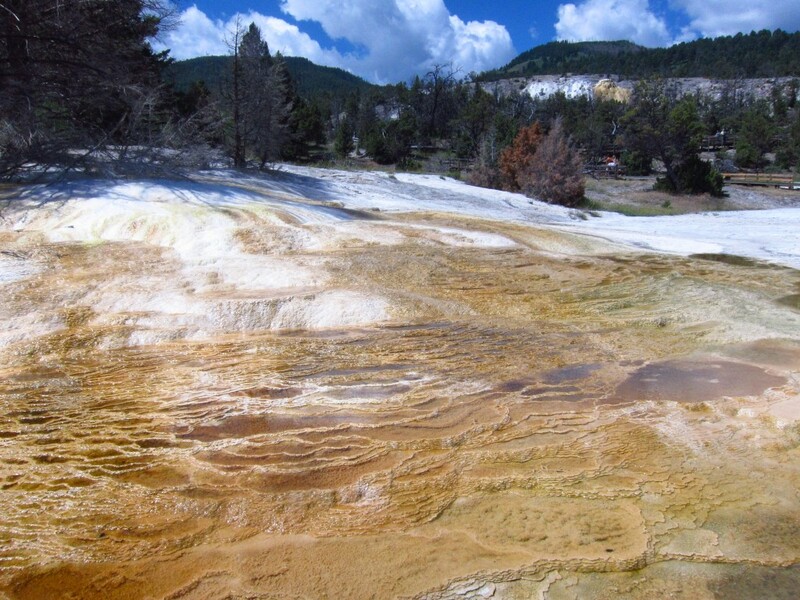 But it was only when we booked the trip and I started doing research on Yellowstone that I found out about Mammoth Hot Spring Terraces. 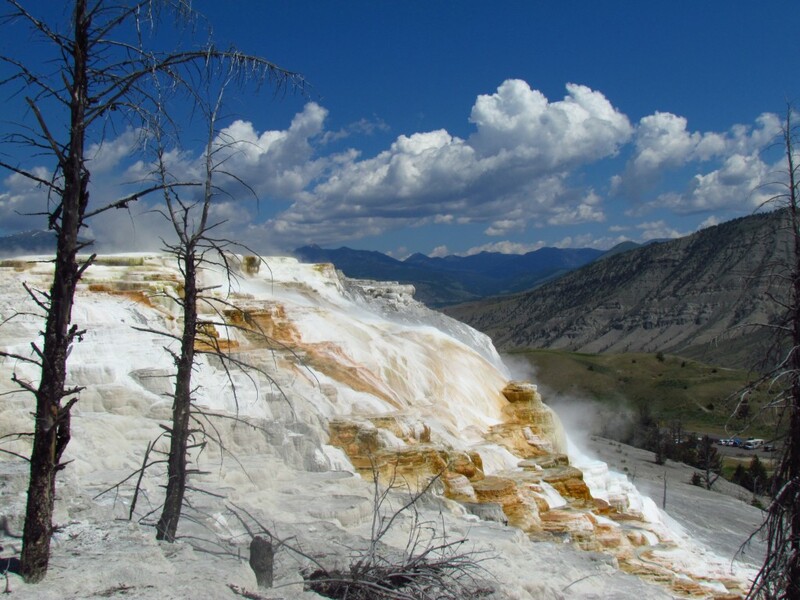 There is a lot of thermal activity in the park, consisting of geysers, thermal pools, mud pools, and steam vents, and the Mammoth Hot Springs are another example of the thermal activity. They are a collection of layered thermal pools that form as water from the springs cools and deposits calcium carbonate to form the pools. 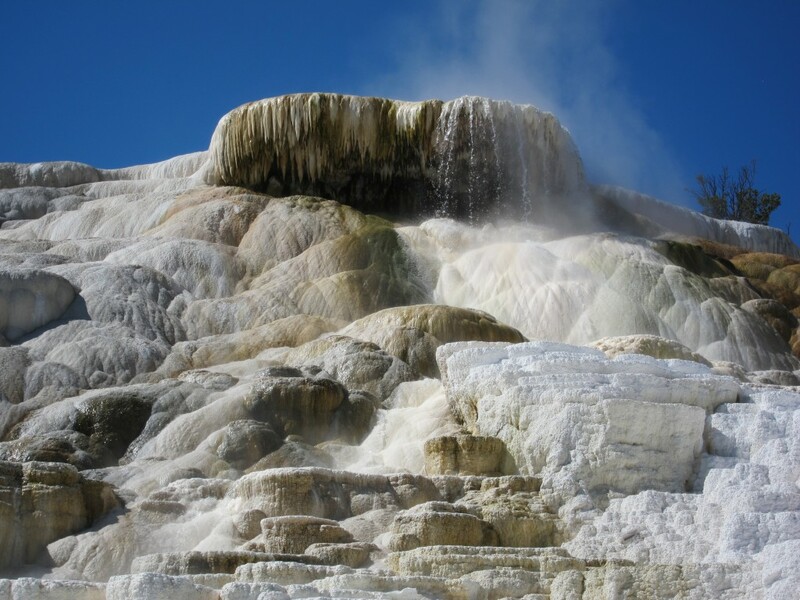 The amazing thing that we learned about the Mammoth Hot Springs is that the scenery in that area is always changing because of the way the water flows! At all times, about 1/3 of the pools are active, and 2/3 are no longer active. People who came to the park a decade ago saw a different set of active pools than we saw this summer. And when we come back there with our kids, we will see different views than we saw this summer. The colors of the pools come from Algae living in the warm water. Amazing! 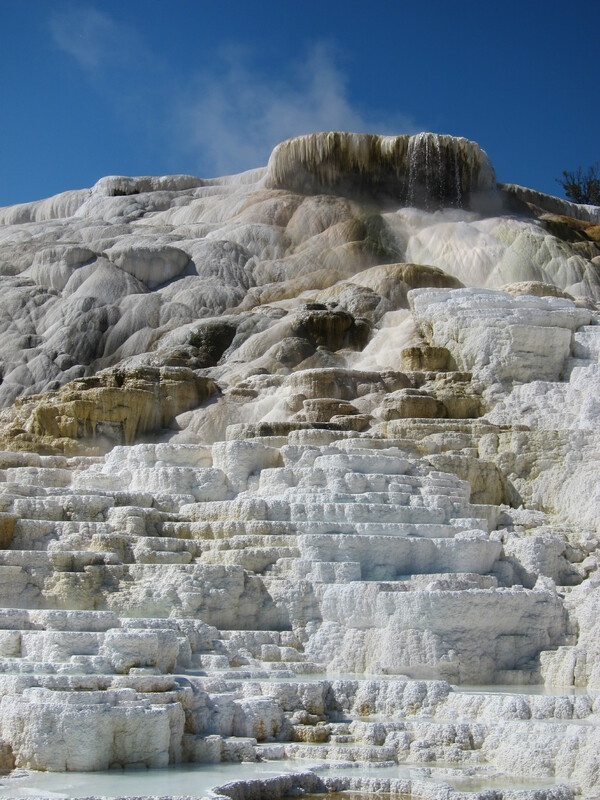 Here is a tip for visiting the Mammoth Hot Springs: It is one of the more busiest areas of the park, so it is best to go first thing in the morning. You might have to wait for a few minutes for a parking spot at one of the 3 parking lots near the Lower Terraces Area, but it is worth the wait. Take a walk all around the boardwalk to see all the Lower Terraces, but there is no need to go all the way up to the top of the boardwalk by foot. I mean, you can if you want to, but if you are tired from sight-seeing, get back into your car and drive the Upper Terraces loop. There will be a smaller parking lot there (where the Upper Terrace Loop Drive on the map meets the dotted boardwalk loop of the Lower Terraces), but we didn’t have to wait for a spot – probably because most of the people were fighting for a spot at the Lower Terraces. 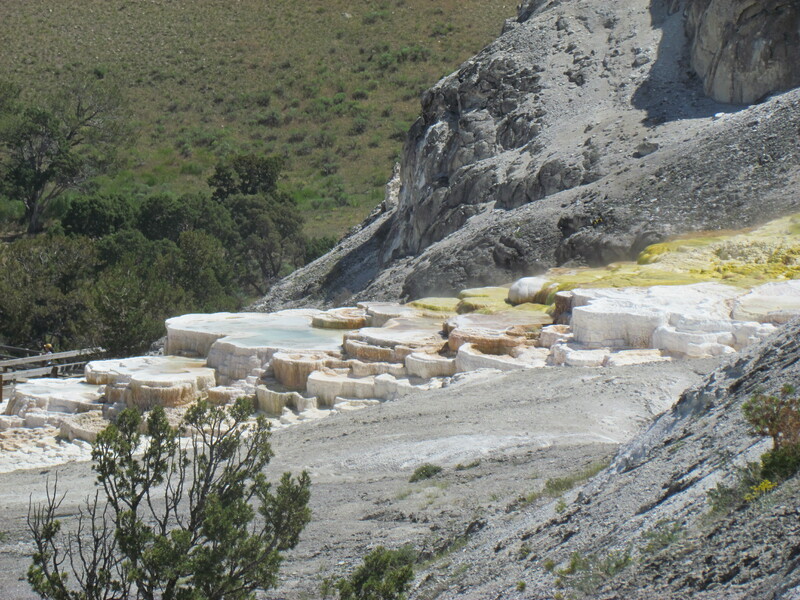 From there, you can walk down the boardwalk see the most amazing part of the Mammoth Hot Springs: Canary Spring. I seriously took dozens and dozens of pictures of the Canary Spring, I couldn’t get enough. It is definitely worth going to even if you have only 1-2 days in the park. The only thing I wish is that they had helicopter rides to get aerial views of the area!